Conversation during the motorcycle ride has before the intercom era been "sign language" such as a more or less friendly stroke on the other person on the motorcycle. Well, if the speed became too high, then the stroke might not have been that friendly.. Just imagine, that when driving your car it is only natural to talk about life, the daily experiences and what you experience during the ride. With the new Cardo C3 this is now possible during the motorcycle ride also. For more than 25 years we have beein riding motorcycle, and have in reality not been missing the opportunity to talk during the ride. But now where we have done this during the test, we agreed that this is what we should have had years ago. It is pretty comfortable - and cozy - to talk together during the ride. You will get the Cardo Q3'eren in a nice bag contaning all necessary equipment for mounting the motorycle intercom on the two helmets. The first impression is quality - and it lasts all way through. 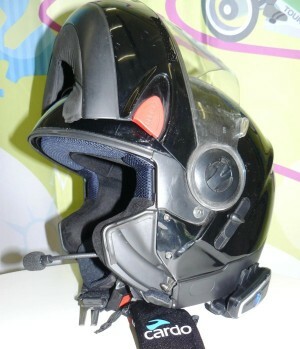 We both have flip-up helmets which makes it easy to access the inside of the helmet for mounting. So the mounting was no problem, as the helmets are prepared for the loudspeakers and the rest is easy to fit inbetween the inside of the helmets, as all the inside linings can be clicked off easily for fitting the wires. There are only one thing to be awar of. You need to pull the cord between the loud speakers on top or your heat, as the wire also have antenna function for the FM radio. Do you have any questions in realation to the mounting and usage of the Scale Rider Q3, then there are many suggestions of how-to on Cardo's web page as there are pretty good FAQ's answering the most common questions users asked. Bike-to-bike function I have not tested yet, but based on the other functions of the Scale Rider Q3 I am sure it will be brilliant, and I look forward to the test. One of the things I found extremely easy was using Cardo's web page. The intercon kit is ready to mount, however, there are always some set-up you want to make adjustments in the settings to suit your personal preferences. Even all is stated in the manual, it is a great help to create a profile on the Cardo web page and use their web based tool. One of my personal preferences are to increase the sound as the noice level increases inside the helmet - and that is done by a single click. As to protect my hearing I always use the cheap foam ear protectors, and therefor I need a higher volume when the noice increases, which was easily done on the web page. After several years of motorcycle riding with the Garmin Zumo 550 gps mounted on the motorcycle, it is now a great pleasure to get the instructions in the helmet. Now the driving safety has reached a new level, as the focus is fully on the road and enjoying riding the motorcycle. The instructions are loud and clear, and in combination with listen to the radio, the radio is muted when there are an instruction and it is automatically returning to the radio when the instruction is over. Pretty smart. The intercom is in stand-by in order to offer a long battery life. That is a good solution, and all it takes to activate the intercom is to make a sound. You just need to make a sound and wait a bit, then both headsets are activated and you can start to speak. The intercom is powered up perfectly long time, so you can continue the conversation even after some seconds of silence without waiting for the Q3 to power up again. Who have not tried to practice for the next X-factor as nothing better to do? There are not so many other sounds than the motorcycle and the wind, so why not sing a bit. That I luckily do not need doing anymore - and I would never win the X-factor anyway. Now it is possible for me to enjoy the latest news and some music while riding the motorcycle. It is a fantastic technology developed by Cardo where all noice is filtered out. Technically there are two microphones combined, so there are one on each side. One heading towards the mouth and one opposite. The technology filters out all sound which are received by both microphones and only the microphone heading towards the mount is transmitted. This was tested during normal driving speed, with and without the visor open. The result is amazing, as everybody I spoke to during the ride simply could not hear that I was riding my motorcycle. To get the most pleasure out of the Scale Rider Q3, it is recommended that you do not want to use all functions at the same time. I have tried to listen to the radio, receive gps instructions and have a conversation with the back-seat passanger. Well, it is not due to I am a man, and cannot multitask. But the Q3 is muting all when there are gps instructions, and then you do not hear the radio nor the passangers words. Optimum is to have as few simultaneous things going at one time. As mentioned earlier, I use the cheap foam earplugs, and it is about time to review that, as the damping is too hard in the entire range. There are some smart earplugs on the market, such as the Alpine Motosafe which I want to test in the future. I am pretty sure they will increase the pleasure using the Q3. To turn on the radio you need to double-click on the MM button, and to search for a new radio station you need to click on the "V" button and..... There are pleanty of functions to remember - and there are nothing to do about that, except to learn the most common ones. The number of clicks and combinations are on the high side. I am already very happy using the Scale RIder Q3'eren, and I am just thinkng about why I did not got an intercom much earlier... It gives a new and positive dimension riding the motorcycle, and the Q3 can only be recommended to all motorcyclists. Cardo Q3 is imported in Scandinavia by www.duells.dk who also kindly supplied the intercom for the test. Alternatively visit www.cardosystems.com for a reseller in your region of the world.